Love this comforter set, it came quickly and it matching my bed room perfectly.. very comfortable pillows last very long!!! Donovan is an elegant update to your bedroom. This red comforter features a modern color blocked look with embroidered taupe details. The bold red stripes draw your eye into this beautiful comforter. Three decorative pillows further accentuate the colors and embroidered details in this collection. Also includes two standard shams which pull the whole look together. The comforter is made from 100-percent polyester and is machine washable for easy care. Not quite as long or wide as I had hoped, but still a very nice comforter set. The detail is beautiful and the color is vibrant and goes well with our bed which has a lot of detail also. The only thing is it's not very soft so we only use it when we make up our bed, not to sleep with. Material is scratchy on your skin but looks nice. I was skeptical as other reviews stated it was a bit short. While it is a it short both on length a width, it's not bad at all. One of the reasons I chose this set was because it was guy friendly and yet still feminine. I bought the king in blue and I love it! It's not heavy but still keeps me warm. I don't like too many blankets on the bed because I sweat. I live in the northeast where we frequently get snowstorms, such as right now, and the comforter is plenty for me to keep warm. I love the color combination of this comforter set. However, I had it about 2 weeks and noticed there was a open gap between the red/brown stripe and the beige part of the comforter.....about 8 inches long. I was able to stitch it up, but was dismayed that it had happened. I would have returned the item for a replacement, but I had removed all the tags. Very pleased with this bedding. Bought the king size and it is a little short on the sides, as some of the other reviews mentioned. But for the price, you can't beat it. I was looking to do an inexpensive mini-makeover in my bedroom, and this fit the bill perfectly. The three included pillows look great with my existing pillows. If you need matching window treatments, check out the Madison Park Tradewinds valances. They are a perfect match! Striking colors. Very lovely on our West Indies style canopy bed. Quality is good for the price. The only downside is the comforter is short width-wise, but we do have an Eastern King bed. The comforter falls about 2 inches off the edge. So, I partially cover the comforter with a satin bronze coverlet that I had also purchased from Overstock a few years ago. It's a perfect spring ensemble that still maintains the color scheme of our bedroom. We are happy with the purchase. Bedroom in a bag is certainly the way to go. 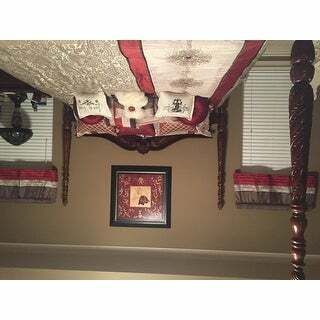 This bedspread looks dynamic in our red bedroom. It added the WOW to the red room. Comforter is not as soft or plus as I would have liked. Good looking, well made, great fabric and matching pillow cases and shams. Can't lose with a product like this. I saw this on 2 different computer screens and unfortunately the beige was MUCH darker when it arrived then pictured. Had to return it because next to my furniture the beige would have looked dirty. Unless it was nice. I wish it was lighter like shown . This is a wine red (not a red, red) and beige with brown accents comforter set. It is heavy for winter and looks very nice. I love the product, great attention to detail, lovely fabrics, but it doesn't fit the new mattresses. Queen mattresses are so much thicker today and this comforter doesn't hang over the sides to cover the sheets, And it isn't long enough to pull up to the headboard. I usually buy king comforters for this reason but when purchasing a set, the king dust ruffle would be too big for the queen frame. When will the size of the comforter reflect the size of the mattress? love this bedspread! Fit perfectly on our California king! the colors go perfect with the bedroom walls I just painted. Very Classy bedspread! Perfect weight, color, style, absolutely love this will recommend to family and friends. Love It! Love It! Love It ! goes really well with my new farmhouse furniture the burgundy is very rich and really bring color into my room I am very pleased with this purchased and I would give this item a thumbs up!! Wrong color didn’t like the colors! This comforter is very warm, it is keeping us toasty this winter! This comforter set is a nice set, rich color and just makes the bed beautiful. It takes the bedroom from an ordinary feel and look to a more sophisticated look. This brand is worth the money and its definitely a keeper. "Are there any grey tones in this and is this closer to a burgundy color?" "Hi there! What color are the sheets?" "I was asking why the Madison Trenton is the same size comforter in both King and CA King --I would expect the comforter to be a different size in each category." The King and Cal King comforter dimension is the same. The difference is the bedskirt length and width to fit the mattress better. "Why are the CA King and the King the same size? I thought CA King should be wider -- like 96?" Simply put, a California King sizemattress is 72 inches wide by 84 inches long (as opposed to 76 by 80 inches which is a standard King), making it the longest of the standard mattress sizes. "It's not really red but not burgundy but it's beautiful it's kind of gives it an elegant look you'll love and yes sheets have deep pockets "
"Is it burgundy or red? " No! its Red really nice comforter set! Buy it you'll love it. I did. a DARKER RED THAN I THOUGHT , BUT LOOKS GREAT.